I have volunteered to weave 10 yards of wool cloth, for use in the “Waulking the Wool” demonstration at the Skagit Valley Highland Games. Waulking songs are traditional, as the singing helps create a rhythm for the time it takes a group to full the yardage. Getting into my yarn closet for some “spring cleaning”, I came across 20 skeins of Scottish Shetland wool, in 15 different shades, ranging from mauve to ocean to moss to plum, 150 yards each. At 12 epi, 22”wide, this is just enough for an 11 yard warp, and that cone of black heather, also from Scotland, will work for the weft. 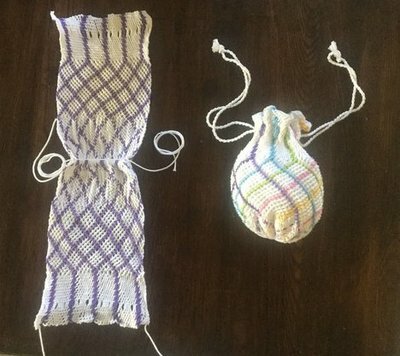 The yarns were all gifted to me from weaver’s estates or over-stashes, and I’m thrilled to be using them up. The warp is measured, see the photo! I have two months to weave the cloth, in time for the 24th annual Skagit Valley Highland Games. I may or may not have Celtic ancestry, who knows? 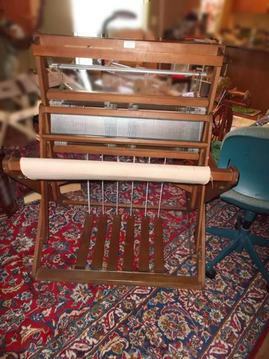 – And I don’t sing, but I love to weave and can’t wait to get going! 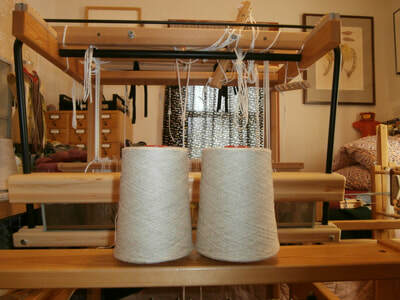 I can’t wait to see what you are weaving, knitting, spinning, felting, stitching this spring. Textile production in Ladakhi villages fits into daily life, with tending the sheep, spinning yarn, and weaving cloth for traditional outer coats all part of the cycle. Tracy Hudson spent several years visiting and volunteering in Ladakh, where she learned some of the language, and then researched traditional methods of textile making in villages of western Ladakh. This presentation traces the process from sheep to finished garment, within the context of Ladakhi village life. More about Tracy Hudson below. 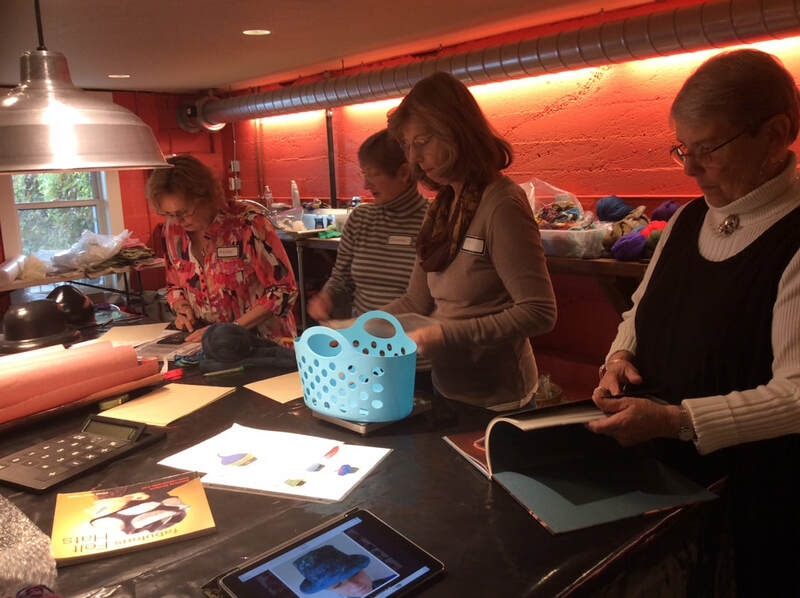 June 16 Saturday meeting & program: Guild Stash Sale! Sign up for a table, or donate your excess to the Guild. Then shop for treasures, novelties and bargains! 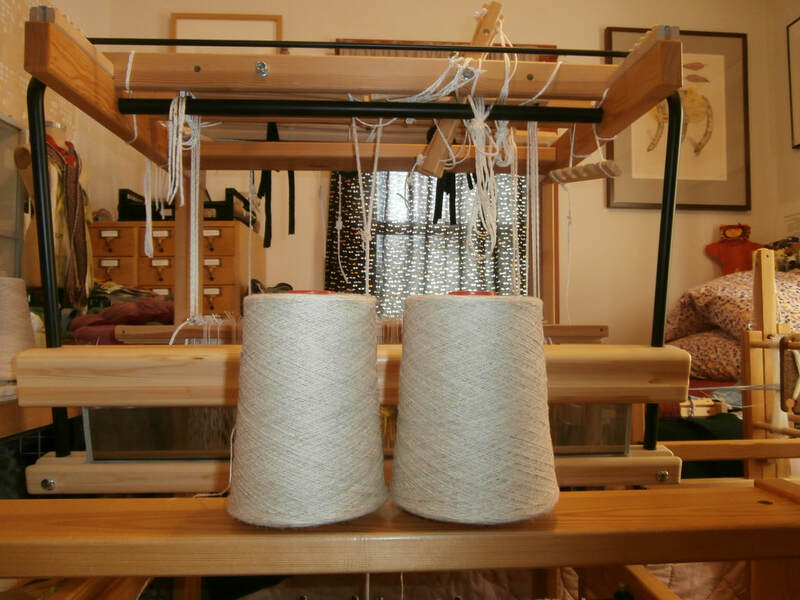 Yarns, tools and equipment may be sold by members, and purchased by anyone! This is a great meeting to invite a friend to. 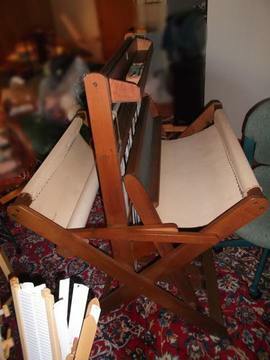 The Whatcom Weavers Guild has been given yarn and tools from the estate of Jo Morgan, a well-known weaver. Proceeds from the sale of these yarns, fleeces, and tools will support WWG activities, including keeping workshop costs affordable. Meetings held at: St James Church (lower level), 910, 14th St., Bellingham. Date: Third Saturday of each month, 10am-2pm. Meeting start—10am. 10-noon—business meeting, show and tell and lunch 12- 1 pm—program. 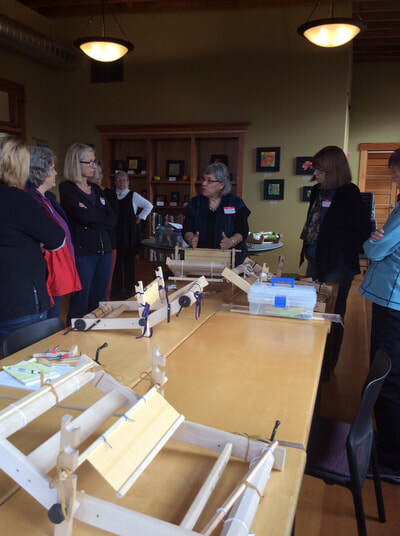 Bring your questions, small looms, spinning or other portable projects for hands-on time after the meeting. Shoji Yamamura is one of the few textile artists in Japan who create double ikat cottons, known as Kurume-kasuri. Hear from the artist himself how his family has created both traditional and new designs for four generations. Textile artist Shoji Yamamura grew up in a household surrounded by the fragrance of natural indigo dyes. There he learned the intricate art of dyeing tied threads, and weaving them to produce distinctive ikat patterns. His family has been creating textiles in this tradition for several generations, known in Japan as kasuri. Their work is known more specifically as Kurume-kasuri, named for their town of Kurume, in Fukuoka Prefecture (southwestern Japan). Yamamura is an innovator in his art, in using many gradations of color and new ways of using natural dyes. In 1996, he was named a successor to the Important Intangible Cultural Asset of Kurume-Kasuri. His work has been exhibited widely in Japan, as well as in Washington DC and New York. Shoji’s works and his assistant Maki’s works will be exhibited in the Quilt museum in La Conner, March 28-April 20. March 17 was a lovely day to visit “Rooted, Revived, Reinvented: Basketry in America, at the Whatcom Museum, for a tour & talk with Polly Adams Sutton, whose work is included in the exhibit! We got past a minor roadblock due to the annual St. Patrick’s Day Parade, to meet Polly at the museum. After viewing and talking about the history of the contemporary basketry movement, we walked over to view “Gathered Together: A Show of work celebrating members of the Northwest Basket Weavers Guild, in the Old City hall, and Polly brought out a collection of her own baskets, which we were able to examine and learn from! If you haven’t seen the Exhibits, they will be up until May 6. 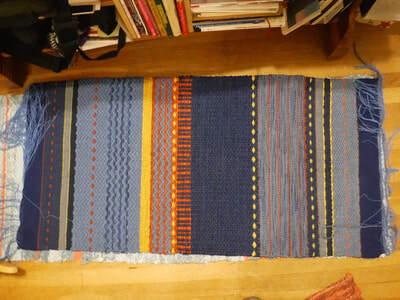 Tracy Hudson: Currently based in Port Townsend, WA, Weaver, traveler and scholar Tracy Hudson been studying, gathering, and creating various kinds of textiles since about 1990. A wandering life has taken her close to several textile traditions, where she has observed closely and learned. Her own work combines traditional textile forms, such as spindle spinning and back strap weaving. She has a passion for experimentation and sharing knowledge with others. Tracy’s website and blog http://tracy-hudson.squarespace.com are well worth exploring. Her online site includes beautiful photos of textiles, places and people encountered in her travels. 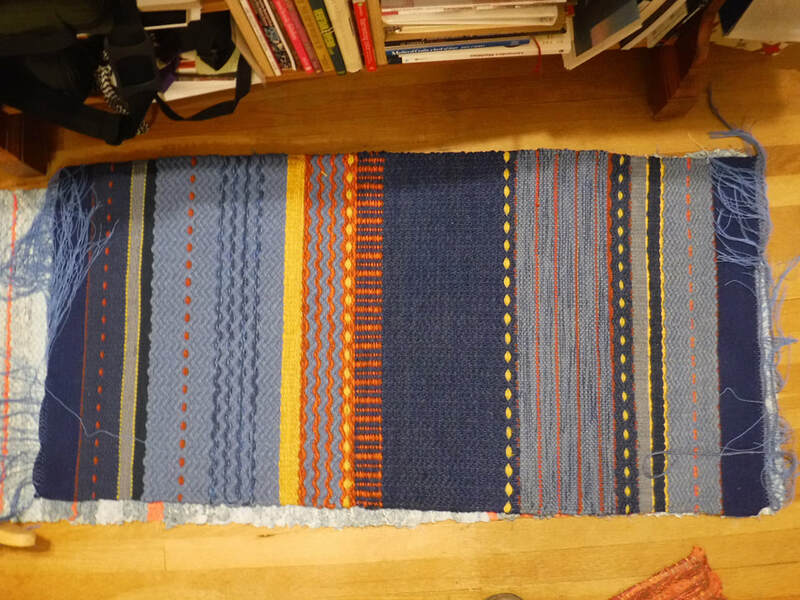 Her blog also includes reflections on her own textile practice, and an extensive bibliography of her published work and presentations, many available to download or view on line. I met Tracy at ANWG 2017, in Victoria, B.C. 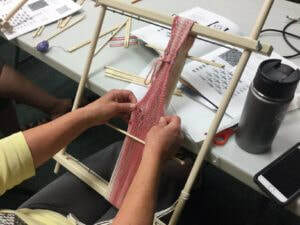 We were enrolled in a workshop led by Brian Whitehead, where we each made a traditional Japanese bamboo reed for weaving. Tracy went on to use her reed with back-strap weaving. I’m very excited to bring Tracy to the Whatcom Weavers Guild meeting in April. Looking further ahead to 2019: Sprang, Anyone? This message comes from from Linda York, Peninsula Spinners and Weavers Guild, who will be hosting Sprang and Finger Weaving Artist and author Carol James for a Sprang workshop in February, 2019. 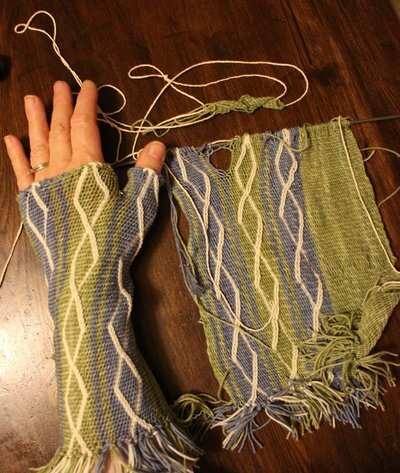 Sprang is an ancient method of constructing fabric that has a natural elasticity. 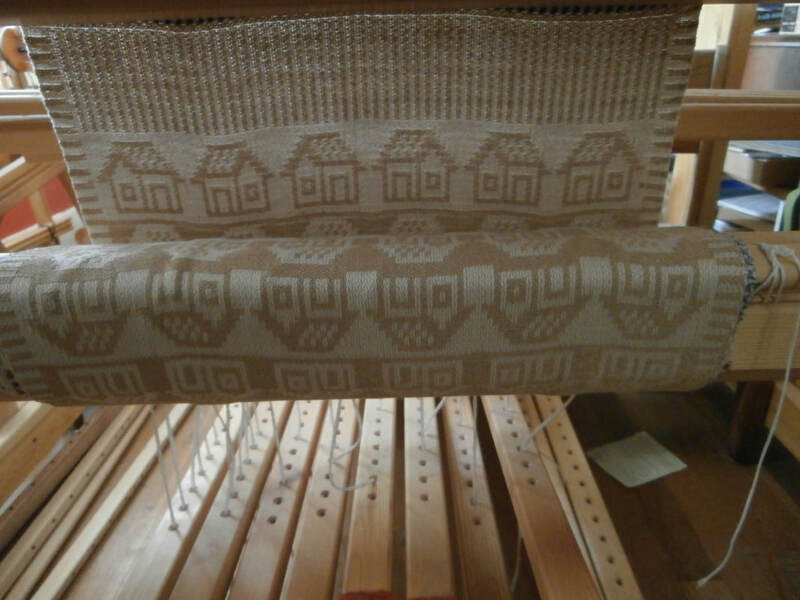 Its appearance is similar to netting, but unlike netting sprang is constructed entirely from warp threads. 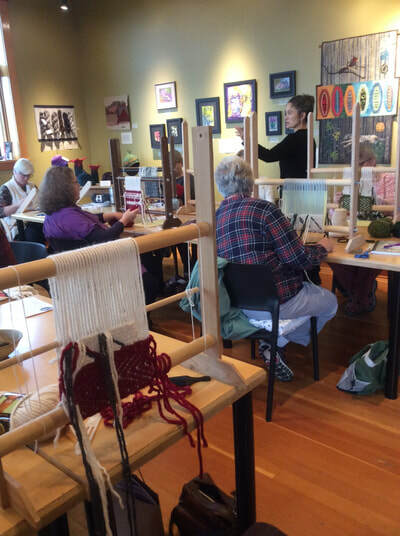 The Whidbey Guild will also be hosting Carol James for a workshop. Carol will be visiting the Whidbey and Peninsula guilds during February 7-14 and offering workshops for us. If WWG would also like to schedule a workshop with her, the guilds would be able to share in her transportation costs and each guild would be responsible for lodging when she is at each guild. Natural dyeing, eco dyeing, dyeing for quilters; Summer dates and details TBA. Dye interest groups are $10 for the room plus a modest materials fee. For more information or to reserve your space, contact Sheri Ward at sheri.ward@icloud.com. Spin-Knit nights, 1st & 3rd Thursdays of the month, 6-8 pm; $8 drop-in, $40 for an 8-session punch card. For the dye interest groups, please email Sheri Ward, sheri.ward@icloud.com to reserve your space. 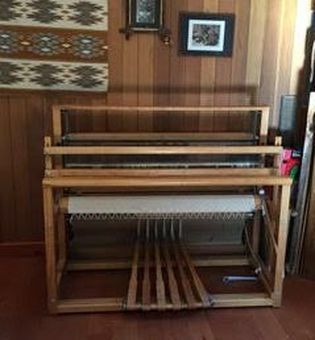 Skagit Valley Weavers Guild stash sale! Date: Monday April 9th at 6:30. One of the Guild members who turned 90 this year has done some serious destashing. 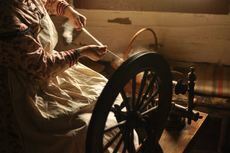 In previous years there have been looms, wheels, raw fiber, roving, books, and so much more. 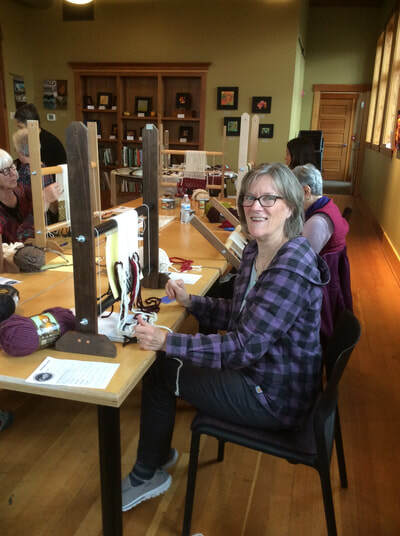 Carpool with a group of Whatcom Weavers by calling Sharon Allen. 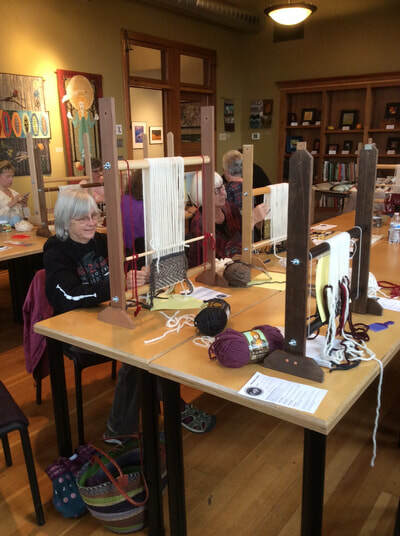 Saturday, April 7, 12-3pm at Bellingham Library for the active Small Looms Group. Join in on the fun with your Inkle, tapestry, tablet weaving, rigid heddle or any loom small enough to bring to the library! June 8, 9 and 10, 2018 Hosted by the Skagit Valley Weavers Guild. Contact Sharon Allen at Sharon.newchapter@gmail.com for more information or click here to see flyer. The cost for this three day workshop with 16 attendees (we can take 20) is $120.00 plus the $20-40 supply fee. Winter is the BEST time to be thinking about the FAIR! Although at least where I live there is still snow on the ground, it's not too early to be thinking about the Northwest Washington Fair. 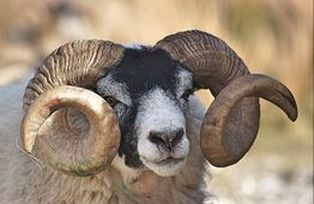 While there are always opportunities for you to be a part of the wool show as a volunteer (You'll be hearing a lot more about that from me later) now's the time to begin thinking about what you will enter in the wool show as well. There are a LOT of different categories and, of course, the more you enter the greater your chance will be to take home those lovely ribbons. Plus, once your entry receives an award, you can note that on the item you offer in the sale. As an award winner, it surely should fetch a much better price. What are the categories? As you may remember from last year, it's not immediately obvious how to find out. But, as of this morning, this is how you do it. Go to Northwest Washington Fair's website. Choose Fair and Rodeo from the menu. Scan down to Fair Exhibitors Guide/Premium Book. Scan down to Open Class Departments. Go ALL THE WAY to the bottom of this page and click on Wool. Also, if what you want to enter isn't listed, again, now's the time to make changes. So, please let me know what they are sometime soon and I'll see what I can do to get them changed. 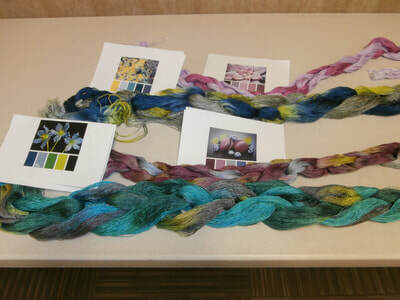 We are excited that Olds College will be offering a Master Spinner Class, Level 1, at the Jansen Art Center, May 18-22. 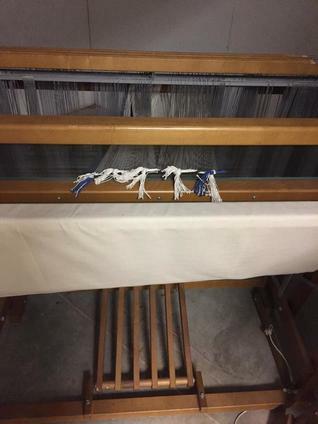 Olds College, based near Calgary, Alberta, is one of the few colleges offering textile classes: master spinning and master weaving classes among them. They offer only a few off-site classes, and none on the west coast of the US, so this is a great opportunity for spinners in our area. You might note that the course doesn't appear on the Olds College website (oldscollege.ca) currently. That's only a temporary delay - this month they’ve been transitioning to a new website for the whole college, so changes to the old website are temporarily halted. Everything should appear there normally in February. That won't impact participants' ability to register, as the online registration system is a separate website, and the phone number leads to someone who has all the course information. This is a 5-day intensive class, and the fee is $940. If you plan to stay in Lynden during this class, the Inn at Lynden will have special room rates available for participants. Please call the Inn at 360-746-8597 for reservations and let them know you are part of this class. More information about the Inn can be found at www.innatlynden.com. For information about master spinner certificates please click here. The WWG Annual Sale will take place on Saturday, October 13, at the Jansen Art Center, in Lynden, WA. All are encouraged to put on a warp for towels, runners, rugs, and more. Quality and style in woven, knitted, felted, and hand-dyed items were all in demand by an appreciative public in 2017. This is a fun and lively all-hands event, with volunteer and demonstration opportunities for every interest and skill level. We have some great workshops lined up for Fibers and Beyond. Here’s the current list, and there’s more coming. Liz Moncrief will offer Warp Painting on Saturday, Oct. 13. Caryn Friedlander, a local artist, will offer an Eco-Dyeing workshop on Friday, Oct. 12. Save the dates and stay tuned for other workshops that will be added to the list. And be creating some wonderful items for the exhibit and sale! If you have not renewed your membership for 2018, it's not too late. You can send a check for $25, made out to Whatcom Weavers Guild, to WWG, PO Box 403, Bellingham, WA, 98227. We hope to see you soon! 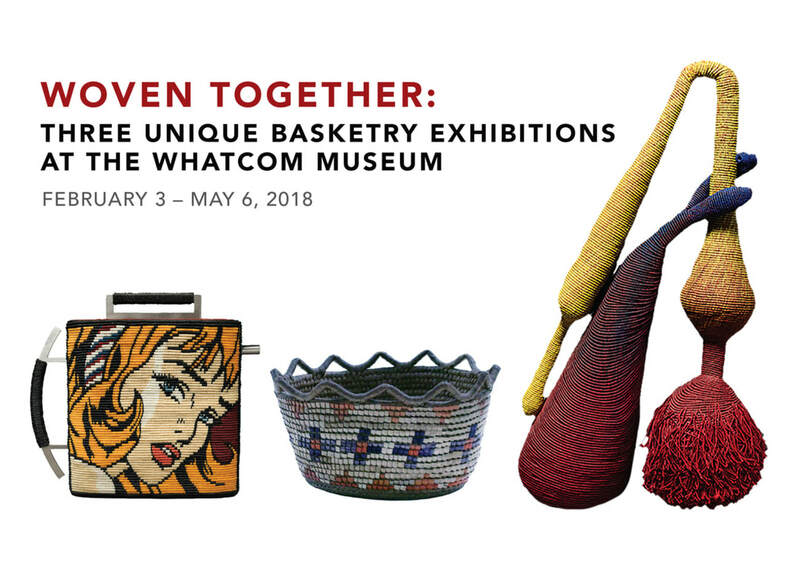 Visit the Whatcom Museum for a dazzling array of baskets in three exhibitions! 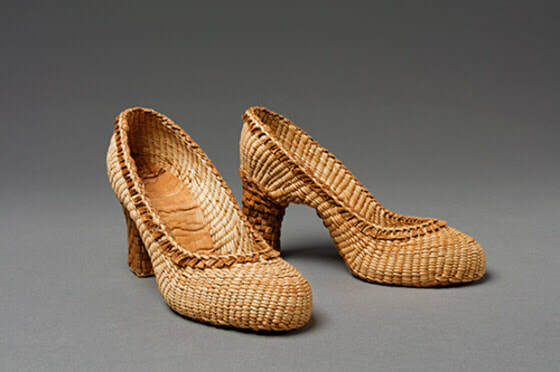 This exhibition showcases 93 objects, from historical baskets rooted in local landscapes and shaped by cultural traditions, to contemporary baskets featuring non-traditional designs, materials, and techniques. Rooted, Revived, Reinvented is generously sponsored in part by the National Basketry Organization, the University of Missouri, the Windgate Charitable Foundation, the Center for Craft, Creativity, and Design, and numerous private donors. Additional support is provided by the Northwest Basket Weavers Vi Phillips Guild, the City of Bellingham, the Whatcom Museum Advocates, and the Whatcom Museum Foundation. 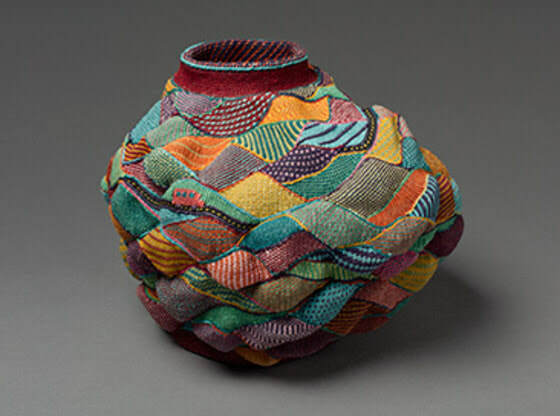 View a selection of artwork at Old City Hall by members of the Northwest Basket Weavers Guild in an exhibition juried by Lisa Telford and Katherine Lewis, artists featured in Rooted, Revived, Reinvented. Curated by Rebecca Hutchins, Curator of Collections, Hidden in the Bundle features a selection of baskets from the Museum’s extensive Native American and First Nations collection. Representing different eras and cultures, the baskets showcase unique, innovative, and even playful elements of design or decoration. Image credits from left: Kate Anderson, Lichtenstein Teapot/Girl with Ribbon, 2005; Waxed linen, stainless steel, 9 x 10.5 x 2 in. Lent by David and Jacqueline Charak. Courtesy of the University of Missouri. Carrying basket, Salish. Gift of the Estate of Carl Cary. Whatcom Museum #1992.7.24. Jane Sauer; At Last, 1999. Waxed linen, 21 x 13 x 8 in. Courtesy of the University of Missouri. Joanne Segal Brandford, Shoulder, c.1986. Bamboo, paint, 10.5 x 16 x 9 in. Courtesy of the University of Missouri. Lois Russell, Magic Bus, 2012; Waxed linen, 9.25 x 11.5 x 10.5 in. Courtesy of the University of Missouri. Join us for a variety of related programs highlighting the art of basketry. ​Visit whatcommuseum.org/events for more details. Take a docent-led tour of two combined exhibitions, Rooted, Revived, Reinvented and Jeweled Objects of Desire. Tours last one hour and begin in the lobby of the Lightcatcher. 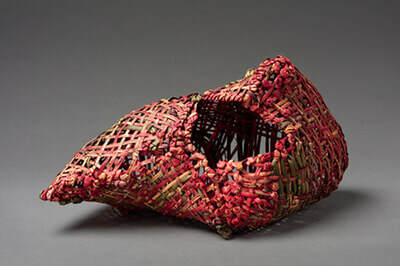 Members of the Northwest Basket Weavers Guild will lead tours of the juried exhibition, Gathered Together, to discuss some of the techniques, designs, and materials used. Enjoy a lively discussion in Old City Hall with Kristin Schwain entitled “Canastromania: Or How Basket Fever Transformed American Basketry from 1890 to 1940,” followed by an informative gallery tour at the Lightcatcher with Jo Stealey. Visit the Museum today and celebrate the innovation and reinvention of basket art. Experience basketry demonstrations, participate in hands-on activities, and meet with basket artists to learn about their work. Image credits from left: Lois Russell, Magic Bus, 2012; Waxed linen, 9.25 x 11.5 x 10.5 in. Courtesy of the University of Missouri. Lisa Telford, Evening Out, 2007. Red and yellow cedar bark, 5.5 x 3.125 x 8 in. Courtesy of the University of Missouri. Joanne Segal Brandford, Shoulder, c.1986. Bamboo, paint, 10.5 x 16 x 9 in. Courtesy of the University of Missouri. 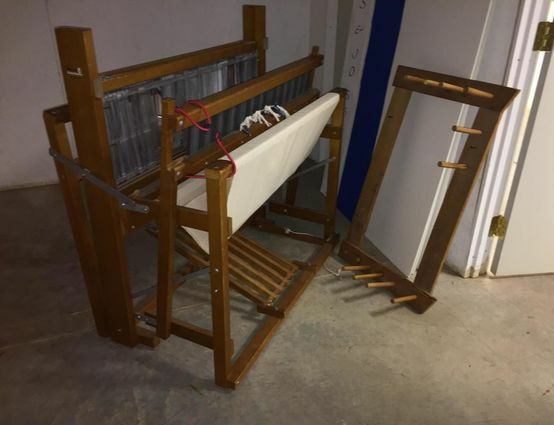 Nilus Leclerc maple jack loom- 4 harness —$600. Great Condition!